ARE DRONE FILTERS WORTH IT FOR PHOTOGRAPHY? I often see a lot of people asking “what filters did you use?” and also spending money to buy them. Therefore to help clear up any confusion, set the right expectations and hopefully save some peeps a few bucks here’s a quick little brain dump on filters. It might be of some help to those who may be new to photography. I tend to think of filters in two groups. Optically altering and non-optically altering. Filters such as UV and polarising filters literally change or modify the light. ND and Grad ND Filters do not modify the light. Just part of my personal Lee Filters landscape kit. Whilst there’s literally hundreds of filter variants not all of them are applicable to aerial photography so I’ll explain the four different types of filters I often see people ask about or buy for drones. 1. UV: A UV filter was traditionally used to block UV rays from the film. Digital camera sensors have an IR or UV filter built in making UV filters completely redundant for this purpose. Many still like using a UV filter to protect the lens of their camera from scratches. Personally, I’ve never used a UV / clear filter for protection. I’ve never scratched a lens and the lens of a drone camera would be even harder to scratch (given they’re used in the air). I’ve seen a lot of people buy UV / Clear filters for their drones and IMO this is of no benefit and in-fact will degrade image quality. These could be seen to benefit aerial photography in a number of ways. They remove reflected light waves, reducing glare and helping improve clarity in things such as water and clouds. They can also help improve the natural saturation of colours. -They work when they are perpendicular to the direction of the sun. This is controlled by manually rotating the filter which obviously one cannot do when their lens is in the air. -The guessing game of ‘putting her on and sending her up’ can impair the image with uneven areas of polar reduction. -Photographers compose their shots to ensure uniformed saturation with polarises. Again, this isn’t possible when the lens is in the sky. -Polarises reduce approx. 2 exposure stops of light which has subsequent impacts when your camera is airborne (I’ll get to this below). 3. Neutral Density (ND) filters. I think ND filters are one of the more misunderstood filters in the drone community. ND filters are optically neutral, meaning, they don’t change the light like polarises or UV filters do. ND filters are literally just darkened glass (perspex, plastic etc). Landscape photographers will have many times when they need to reduce the amount of light entering their lens. This comes down to the basic principles of exposure. Ie. Exposure is a product of three variables. Shutter speed, aperture and ISO (film sensitivity). If a photographer wishes to reduce their shutter speed they are then allowing more light into their lens, this is compensated by closing the aperture. For example. 1/1000th of a second and f2 is the same exposure as 1/500th second and f2.8 and the same exposure as 1/250th second and f4 and so on. All variables work in sync. So if a photographer needs their shutter speed to be slow (ie 1/8th second) they need to compensate this with their aperture. In the above example 1/8th sec would be an aperture of f22). This isn’t always achievable or ideal, so, enter ND filters. IMO, this isn’t valuable in drone photography because the only value of slowing the shutter speed would be for long exposures (to blur water for example) which requires a tripod. Some might say their gimbals are magic and can allow for this, and whilst it’s a fun novelty, the image won’t be sharp or useable for anything other than phone size screens. So why do ND filters serve no other purpose? 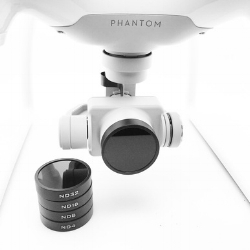 Some drone camera’s such as the P4P and Inspire camera’s allow for aperture control. Even on drones without aperture control and fixed at f2.8, if you need to reduce the exposure you can simply dial up the shutter speed. (I'll pause here to make it clear I'm talking to photography and not videography. I absolutely agree some videographers will want ND filters for many other reasons). 4. Grad ND: Grad ND’s are filters which gradually change from clear to a darker number of exposure stops. These are invaluable for landscape photographers when they want to balance their foreground light with the higher exposure of the sky. Could you do that on a drone when airborne? I guess maybe. Would I spend money on a filter for it for my drone. Nope. I’d take two exposures and blend them. It’d be easier than trying to balance the horizon along the grad line in the air.